Who is Jerod Morris? I think that’s an important question and one deserving of a public answer because if you’re in the online marketing and especially, the podcasting world, you need to know Jerod. So let’s get started. Jerod (@JerodMorris) is part of a small team that plans, produces, and markets the content for Rainmaker.FM, Copyblogger’s digital marketing podcast network. He hosts two shows on the network: The Lede and The Showrunner and also develops new shows. Jerod speaks regularly at industry conferences and produces Rainmaker Platform webinars. Simply put, Jerod is an Authority on podcasting and Rainmaker for Copyblogger Media. As part of our ongoing series for the Authority Rainmaker conference, check out this interview where Jerod provides a view into his start and success with podcasting including tips, examples and some insights into the top talent at Copyblogger Media. Among many talents, you are widely considered a growing authority on blogging and podcasting. What has been your inspiration? What motivates you about creating content? Many? That is very kind of you to say, even if my more self-critical side disagrees with you. 🙂 But what is perhaps ironic about what I’m about to say is that I do not feel like any authority I’ve been fortunate to attain is based on talent. I think any authority I have is based more on the kinds of things I’ve done that do not actually require talent: showing up, working hard, and caring about what an audience takes away from my content. I do hope that my actual abilities improve with the repetitions of this process, but what truly inspires me and motivates me is how much a connection with an audience can be created independent of talent. It’s empowering. For example, I don’t feel like I had any particular “talent” to host a postgame show for Indiana University basketball when we launched The Assembly Call … but my co-hosts and I just kept on showing up, and we worked hard to provide good analysis, and we genuinely cared about giving our audience a good experience and connecting with them. Which is why our audience has grown like it has. And hopefully our ability to produce a compelling live broadcast has grown as well. But the inspiring and motivating part is how we were able to develop a minimum viable audience before we really had what would be called “talent.” We had heart, desire, and empathy, and that was enough to start. I wish more people would realize that. By starting in the content marketing and blogging world in 2008 (is that right? ), you were ahead of a game that has exploded in popularity ever since. What has changed in business blogging and podcasting for 2015 and beyond? What advice would you give to someone just starting out? Yep, 2008 is about right. That is when I joined Orangecast in Dallas, an SEO and social media marketing agency, and it’s when I launched Midwest Sports Fans to get my hands dirty in WordPress. 🙂 Wow a lot has happened since then! The single biggest change I have seen is the return to empathy. The single biggest change I have seen — both externally in terms of what is taught by the “experts” and internally in terms of what I viscerally feel is right and know works best — is the return to empathy. Back when I started, I viewed the Internet much more from a “what can I (or my clients) get out of it?” mentality. Now, it’s much more of a “What can we give to an audience?” mentality, with the knowledge that genuine giving is almost always reciprocated in ways that far exceed what is given. It’s a beautiful and flowery notion, yes, but it’s also nuts-and-bolts reality that works time and again. So my advice to someone starting out would be to channel my inner JFK: “Ask not what your audience can do for you; ask what you can do for your audience.” Do that day after day and you’ll succeed. Most podcasts that are now considered market leaders began in relative obscurity. Unfortunately, some podcasters run out of steam before they achieve momentum. What advice would you give to help motivate podcasting even when they aren’t seeing any significant business impact yet? Podcasting may be the hot new content medium right now, but it follows the same fundamentals as text blogging, video blogging, and every other content medium. And chief among those fundamentals is that true success in online content is a long game. A few people might experience meteoric rises right off the bat, but ultimately they have to do something else to sustain it. Some do, many don’t. So don’t worry about winning the web lottery. Just have faith in the long-term impact of showing up, working hard, and caring. Lay enough of those bricks day after day and you’ll eventually connect with your audience. The dirty little secret of success online is that it more often is a war of attrition and attitude than a war of aptitude. If you are struggling, you may want to rethink your direction, or tweak your content, or dig into learning more about your audience … but success is out there for you if you’re truly committed to it over the long-term. Many influential people who are considered subject matter authorities also have lesser-known skills or areas of expertise. An example is Bob Barker, best known as an authority in game show hosting, who also is a black belt in Karate, taught by the legendary Chuck Norris. What is one interesting skill or area of expertise you have that is not well known? I grew up in Indiana, so if a game of H.O.R.S.E. or a three-point contest ever breaks out at Authority Rainmaker or Content Marketing World, I’d be a good guy to have on your side. 😉 A true Hoosier can always shoot it. What are you most looking forward to at the Authority Rainmaker conference? What sets it apart from other events? I made so many great connections last year that have turned into real friendships since, and I can’t wait to see those faces and hear those voices in person again. And having been to many other events before and since our conference last year, that is what continues to stick out to me about it: the sense of community and togetherness that was palpable. Part of it is the attendees being part of the same online tribe, and the other part is the single-track format that gives everyone the same experience. I don’t even see it as “networking.” It’s connecting with friends and making new ones. That we’ll all be able to help each other out in business down the road is secondary, and that’s how it feels. Most influential people have others they consider to be more authoritative than themselves. Who is an influential person who you consider to be an authority that influences your beliefs and work? In other words, when they talk, you listen. I didn’t come to Copyblogger with a wealth of experience in copywriting or content marketing or creating courses, or any of that. And so much of what I have learned has been simply by being surrounded by people like Robert and Chris and Brian Clark and Sonia Simone and Demian Farnworth and Kim Clark and scores of others at our company are so smart, so experienced, and so audience-focused in their approach. You mentioned my “talents” above? Well damn near all talent or ability I have attained over these last few years has been simply because I was smart enough to show up for work every day — because that has meant exposure to the brightest minds in our industry. I’m really fortunate to have such an opportunity, and I try very hard to never take it for granted. In addition to that, being part of the Copyblogger team has given me exposure to people I may never have met otherwise. Ann Handley inspires me to be more empathetic. 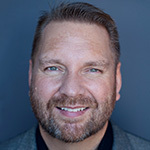 Chris Brogan inspires me to care … and then care some more. 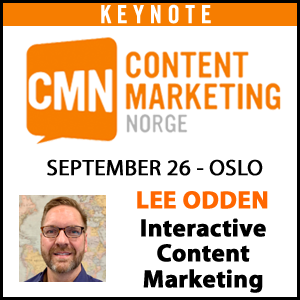 Lee Odden inspires me with his consistency and reliability (and with his impeccably coiffed beard). I could go on and on. There are many voices out there that are NOT worth listening to, but there are a handful that are absolute gold. A big key to success is identifying the people who are worth listening to … and then shutting up and listening. Something else I often remind myself to remember. Are there any examples of brands you feel are really doing a great job with their content? I think what ESPN has done with Grantland has been phenomenal. It’s become my #1 stop when I am looking for sports content, and it’s because the quality is typically so high. From a personal brand perspective, Michael Hyatt always impresses with his consistency, quality, and perpetual envelope pushing. He seems to always be working to take the next step. Everybody starts somewhere, but we occasionally cross paths with people who seem destined to attain authority status in their fields. Who is one person that isn’t well known now but you feel will (or should) be considered an authority in the future? I have had the good fortune of working with Stefanie Flaxman since she joined Copyblogger about a year ago. She has consistently impressed me with her relentless commitment to high standards, her indefatigable work ethic, and her immense team spirit. And two words I’d use to describe her are interesting and delightful. Those two traits alone aren’t enough to get you anything. But when you take someone who is smart, hard-working, and entrepreneurial, and then mix in an interesting and delightful personality, and you’ve got a winning formula. I think Stefanie has that. I’m proud to work with her, and I’m excited to see what her future holds. Look what she has done with Editor-in-Chief already? And it’s her first foray into podcasting. Impressive. What advice would you give a ‘rising star’ to help them achieve authority status quicker? As for advice? Show up, be authentic, and give a damn about the audience you’re trying to reach. If Stefanie and Will just keep doing that, their content will get better and better and better, and their audiences will grow bigger and bigger and bigger. Let’s play social network word association. How would you succinctly describe each network below? Facebook – A double-edged sword. It’s a great place to connect, but you MUST guard against wasting time. Snapchat – A place that reminds me how old I’ve become. YouTube – An oldie, but ever a goodie. I want to do more here. Pinterest – A place I’m sure I could do more, but with what time? Thanks Jerod! 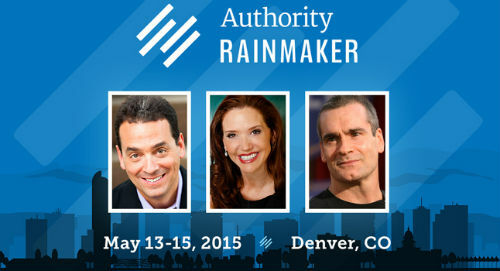 We’ll see you in Denver May 13th for Authority Rainmaker. Check out our previous Authority Rainmaker interviews with Sonia Simone plus keynote speakers Daniel Pink and Sally Hogshead. 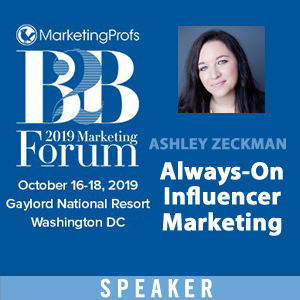 The Authority Rainmaker conference features an incredible lineup of authoritative marketers and business leaders offering inspiration as well as a framework for integrated marketing. Over two days, presentations will cover Design, Traffic, Content and Conversion topics. If you’re looking for one of the best marketing conference experiences, from learning to networking – Authority was one of my top 3 events in 2014. This year it’s going to be even better. Check it out at authoritywins.com while seats are still available! Disclosure: Copyblogger Media is a TopRank Marketing client.